“God’s Work~Our Hands”…..Our project to help out Pecatonica Grade School with breakfast snacks for those who come to school hungry was a success! 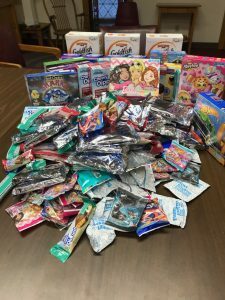 We collected $545 in snack boxes over two Sundays in January. 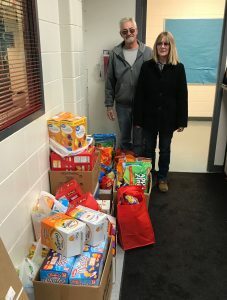 Kathy and Cal Miley shopped for us and delivered a carload of Goldfish crackers, pretzels, fruit snacks, animal crackers, bags of dry cereal and Cheez- It crackers to the grade school. Thanks to your generosity the kids who don’t get breakfast or bring a morning snack will have something to munch on and hold them over to lunch for the next 3 or 4 months. This project is part of an ongoing effort by your Outreach team to do “God’s Work~Our Hands” in the community by helping and serving others. With our upcoming Sixth Annual “Souper Bowl of Caring” on Sunday, February 3rd, we will all have another opportunity to serve others. Bring cans of food, bottles of 100% fruit juice, boxes of cereal or whatever you would like to donate to the pantry and place in the specially marked collection boxes in the church entryway and stay for some delicious soups, crackers and cheese after service on Sunday. You may also make a cash or check donation to the Pantry. All proceeds will go to support our friends at the Pec Pantry as they reach out and serve others. ROMANS 12:13 “Share with the Lord’s people who are in need. Practice hospitality”. A big Thank You to Cal & Kathy for shopping and delivering the school snacks to the Pec Grade School today. We also raised $200, which will be used the first part of April by Andrea McGrew to resupply the teacher’s snack supplies at school. This was a successful two-week project in which our generous congregation saw a need and came through once again! Thanks everyone for being so generous!